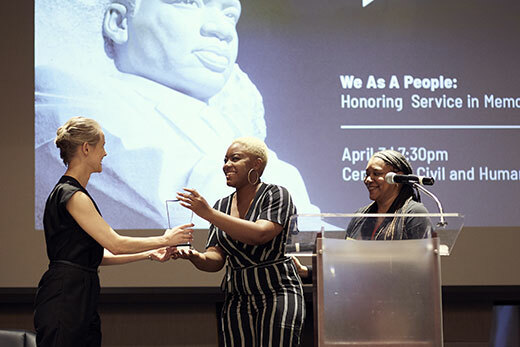 Emory College senior Chelsea Jackson (center) receives her award from WABE-FM during a ceremony April 3 at the Center for Civil and Human Rights. A Rhodes Scholar, Jackson co-founded Atlanta Black Students United. Photo courtesy WABE. To mark the 50th anniversary of the death of Dr. Martin Luther King Jr., Atlanta NPR affiliate WABE-FM held a community-wide gathering at the Center for Civil and Human Rights to honor individuals and organizations who are preserving King’s mission and continuing the tenets of his dream. The event was held April 3, the eve of the anniversary of King’s death. Author, activist and Emory PhD Catherine Meeks served as keynote speaker. Heval Kelli, MD, cardiologist and former fellow of Emory School of Medicine, a Kurd from Syria and advocate for immigrants and refugees in the greater Atlanta community. The event also marked the culmination of ATL68, a four-month-long project by WABE’s news magazine talk show “Closer Look with Rose Scott,” which broadcast a series of conversations, profiles and behind-the-scenes recollections relating to King and the Civil Rights Movement, both then and now. Ellen Gough, assistant professor of religion, talked about the influence of Mahatma Gandhi on King’s philosophy of nonviolent resistance. Robert Franklin, James T. and Berta R. Laney Professor in Moral Leadership, discussed King’s moral leadership. Carol Anderson, Charles Howard Candler Professor and chair of African American Studies, discussed civil rights and social justice movements under several U.S. presidential administrations. Joe Crespino, Jimmy Carter Professor of History, was interviewed about a little-known event, an interracial Passion Play, that took place in Atlanta six months after the assassination of Dr. King. For more information about the ATL68 series, visit www.wabe.org/atl68.